1. What are river corridors and why are they important? 2. How does the State manage river corridors? 3. Why do we need to define river corridors when we have the FEMA flood maps? 4. How are river corridors determined? 5. Why are state highways excluded from the corridor? 6. Why is the small stream setback fifty feet? 7. Will these maps affect what I can do with my land? 8. Are towns required to adopt corridor maps? 9. Can a map be updated or revised? 10. Will maps be updated on a regular basis? 11. Rivers change during floods (like Irene), do the corridor maps take this into account? 12. Why is the River Corridor so wide? 13. How does this affect growth in our Village? 14. Will flood insurance be required now if my house is in the River Corridor? 15. Why is the Connecticut River not included in the River Corridor Map? 16. Why should communities protect river corridors? ANR River Corridors encompass the area of land surrounding a river that provides for the meandering, floodplain, and the riparian functions necessary to restore and maintain the naturally stable or least erosive form of a river thereby minimizing erosion hazards over time. They are mapped using calculations that rely on in-field and map-based measurements. Lands within and immediately abutting a river corridor are at higher risk to fluvial erosion. Giving rivers room to move is critical in avoiding the stream armoring and berming measures used to protect within-corridor development that so often leads to increases in erosion upstream and downstream and adversely affects public safety, riparian landowners, and river ecosystems. The Flood Hazard Area and River Corridor Protection Procedure details how the river corridor map is: created and disseminated; used for state regulatory actions and recommendations; and, how it may be updated or administratively revised with improved data and municipal planning. Answers to these frequently asked questions concerning river corridors, river corridor planning, and the map refinement process are offered as further explanation. FEMA Special Flood Hazard Areas show where inundation would occur during a flood that has a 1% chance of occurring in any given year (commonly referred to as the 100-yr or base flood). 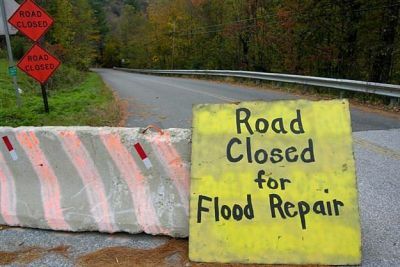 While this hazard information is very important, the FEMA inundation areas have only been mapped for approximately 20% of Vermont stream miles and post-flood damage surveys have shown that fluvial erosion, not inundation, is the most common natural hazard type in Vermont. Vermont decided to develop river corridor maps because they represent a zone for the avoidance and management of erosion hazards. River corridors account for the fact that rivers change vertically and horizontally over time, and, therefore, are not as likely to become outdated as FEMA maps, which are based on the elevation and location of the river at the time when the maps are produced. Within river corridors, floodplains may be formed and maintained over time. This means that corridors may consistently help mitigate both erosion and inundation hazards in comparison to the FEMA map counterpart. The ANR has published documents that detail the process for delineating river corridors, including the Flood Hazard Area and River Corridor Protection Procedure (2017) and the River Corridor Protection Guide (2008). River corridors are comprised of meander belt and riparian buffer components for the purpose of achieving and maintaining stream equilibrium conditions. The meander belt is an area calculated to accommodate the amplitude of stream meanders that have or will form in response to the laws of physics which dictate that channel depth and slope evolve toward a state of minimal work (i.e., equilibrium or least erosive form). The width of the meander belt will vary depending on the amount of land draining to a given point on a stream, so the River Corridor width varies in part based on stream size. The riparian buffer component is designed as an extension of the meander belt to provide additional development setback space so that when meanders move to the edge of the meander belt there is still room to establish or maintain a naturally vegetated buffer that would function as resistance to further lateral streambank erosion. If this extension were not included and structures were planned at the very edge of the meander belt, a prospective home or business owner would need to plan to armor the river bank to protect the structure BEFORE the meander evolved to its stable amplitude. With the additional setback provided by the Riparian Buffer Component, structures may be placed just outside the River Corridor and, as the river meander evolves in the direction of the structure, the space will be available for the full expression of stable meanders, bank stabilization, and the establishment a woody buffer that will provide resistance to the lateral erosion on the channel, potentially avoiding the expense of hard armoring. 5. Why are state highways excluded from the corridor? Does that mean they are not subject to fluvial erosion hazards? On the contrary, where a corridor has been moved and the state highway has been set as the boundary for the corridor, the infrastructure is very much at risk from erosion during a flood. The corridor is shifted to achieve stream equilibrium and floodplain function on lands opposite a major highway in recognition of the investments made to maintain the road alignment. With a full expression of meanders becoming possible away from the road, the erosion hazard will become less to both the road and downstream properties. Alternatively, if the corridor was not shifted and new development was placed opposite the highway, the river would become pinched between the highway and the new structures and become even more hazardous. The fact that ANR has placed river corridors at the edge of the state highways does not change the state’s commitment to transportation corridor planning that will examine erosion hazards where roads and rivers meet. Alternatives including the possible movement of a state highway will be examined based on the benefits and costs and the opportunity to mitigate hazards system-wide within a watershed. If and when a state highway is moved, the ANR will review and, where possible, realign the meander belt consistent with the Flood Hazard Area and River Corridor Protection Procedure. Importantly, this same planning process is available to municipalities who may wish to shift corridors off certain town highways or other public infrastructure important to the community as part of the corridor map revision process, as outlined in the Procedure. River corridors have not been mapped along streams with a watershed of 2 square miles or less. Rather, these streams are managed and protected from an erosion minimization standpoint (i.e., considering meander belt and buffer functions) with a simple 50 foot setback measured from the top of the stream bank. This distance provides a setback for the bank stability function of natural riparian vegetation while also providing space for a meander belt which, for small streams, will typically range between one and four bankfull channel widths. Small streams may be found in any type of valley setting in Vermont, but the majority flow in steep narrow valleys and have meander amplitudes far less than those in wider alluvial settings with more gentle gradients. The standard 50 foot setback will meet the river corridor objectives in most cases and is intended to simplify the mapping and administration of corridor protections. In site-specific applications, the Agency may delineate, or project proponents may provide the field data to define, a corridor for a small stream that may expand the setback from the 50 foot mark. • Town Regulation of land use where the municipality has protected river corridors as part of its zoning bylaws. Such regulations are not retroactive, that is they do not affect land uses and development permitted when the regulations took effect. Any development or land improvement that is exempt from municipal land use regulation in an NFIP-enrolled town is subject to the State Flood Hazard Area and River Corridor Rule. All state owned and operated facilities are subject to the Rule, regardless of the community’s NFIP participation. Generally, these exemptions would include state-owned facilities, utilities regulated under Section 248, agricultural structures, and silvicultural structures (see the Rule for definitions of these terms). Any development requiring an Act 250 permit must meet criterion 1(D) Floodways. The ANR will include the river corridor as a component in its Act 250 floodway determination and make recommendations that the development meet a no adverse impact standard (as established in the State Rule). This standard aims to direct new development out of river corridors, but make exceptions for stream crossings, redevelopment and certain types of infill. These exceptions are described in detail in the Flood hazard Area and River Corridor Protection Procedure. The Procedure also outlines a set of best management practices to help landowners and towns cost-effectively manage stream channels, riparian areas, and floodplains toward stable equilibrium conditions. Town land use regulations may also apply where the municipality has protected river corridors as a part of its zoning bylaws. If your community has adopted a river corridor or river corridor protection area zoning bylaw, the ANR will provide technical reviews and recommendations for municipally regulated projects, when requested, based on the municipal bylaws and the municipally adopted maps. No. State legislation has been passed in recent years requiring ANR to develop advisory river corridor maps for all municipalities, adopt State River Corridor Protection Procedures to include best management practices, and make model bylaws and other incentives to assist municipalities, but have not required action on the part of municipalities to adopt corridor maps at this time. 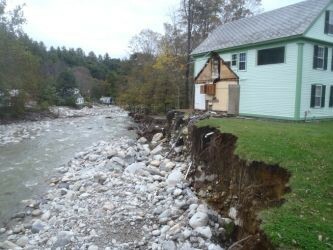 Towns that adopt and enforce river corridor protection standards consistent with the Vermont Model Flood Hazard Bylaws are eligible for an enhanced state cost share under the Emergency Relief and Assistance Fund. Yes. The Flood Hazard Area and River Corridor Protection Procedure includes a section on how the Agency or other parties may pursue major and minor map updates. “Major updates” involve the collection of data and an assessment of stream sensitivity to derive specific meander belt or buffer widths. “Minor updates” include correcting remnants or quirks of the mapping process and single adjustments to factor in features documented with data (e.g., unmapped bedrock outcrop) unavailable when the river corridor base map was developed. The Agency shall publish the updated maps on the ANR Natural Resource Atlas and notify the affected municipalities, the Regional Planning Commission(s), and the Act 250 District Commissions. It should be noted that amending the flood hazard area maps and updating river corridor maps are different and separate processes. For instance, going through the process of certifying the elevation of your property and getting a Letter of Map Amendment approved by FEMA with respect to an inundation zone does not change the State river corridor delineation. Yes. The Agency may conduct updates on all or portions of the Statewide River Corridor Layer as needed (e.g., following major floods), as requested by a municipality, and on a published schedule of watershed-scale updates to incorporate administrative revisions requested by municipalities, Phase 2 stream geomorphic data, and new meander centerline, valley wall, and local field data that are collected and provided to the Agency. Such updates shall be noticed on the DEC and ANR web pages for public review and comment for a 30-day period. The Agency shall provide maps to and solicit comments from municipalities, the Regional Planning Commissions, the Act 250 District Commissions, and other interested parties and notify these jurisdictions when the State has placed an effective data on the updated Statewide River Corridor Layer. A fundamental concept in establishing the river corridor is to accommodate the dynamic processes of a stream, including the changes that may be observed after a flood. Streams can change vertically and horizontally during a flood and the location of the corridor should remain valid. If changes are incremental and the bank lines approach the outside of the meander belt, the lateral movement of the channel may be arrested with bank revetments (green or otherwise) at a given location to keep the stream within the corridor. In this situation, property outside the designated corridor can be protected from fluvial erosion with less concern for transferring risks to properties downstream. 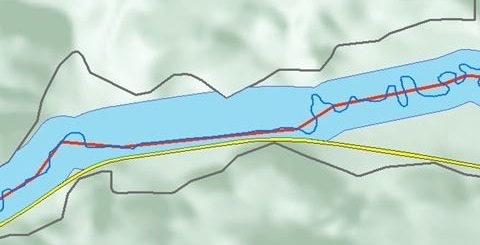 However, map updates may become important as a result of flooding, including those instances where 1) long-term changes in watershed hydrology significantly impact channel geometry and the width of the meander belt, or 2) during a flood event, lateral erosion of the channel happens so suddenly and severely, that the channel is completely outside a previously drawn corridor. 12. The stream in my neighborhood has never moved and the stream banks are lined with rip rap stone. Why is the River Corridor so wide? River corridors are based on the amplitude of meanders that will evolve during floods in different valley types as a river adjusts to toward an equilibrium (i.e., vertically stable—least erosive) condition. When streams attain their naturally stable condition it is easy to see, taking a bird’s eye view, that the meander belt lines are drawn along the outside bends of successive meanders. Setting aside those lands in between fully expressed meanders is easier to make sense of. In contrast, it is harder to imagine a stream that has been straightened and armored as needing the amount of corridor space that has been set aside. While a stream may not move for decades, there comes a time when a large enough flood occurs or a chink in the bank armor sets in motion a process of rapid stream bed and bank erosion and a full occupation of the river corridor. 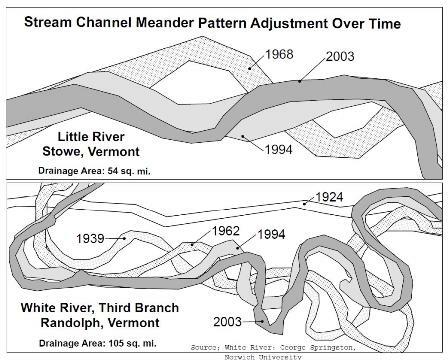 These events have been documented time and time again in Vermont stream geomorphic assessments, as streams work to re-establish floodplains and their most natural meander patterns. River corridors are designed to provide space for this process to happen. It should be noted that the Flood Hazard Area and River Corridor Protection Procedures create opportunities for changing river corridor delineations, including situations where the degree of existing encroachment and the active channel management used to protect those investments preclude the attainment of natural equilibrium conditions (e.g., in a village setting), but vertical channel stability is achieved nonetheless. 13. The River Corridor goes right through most of our village area. How does this affect our community’s growth? Depending on local land use restrictions, the river corridor delineation through a village area is likely to have far less effect on community growth compared with areas outside the village. 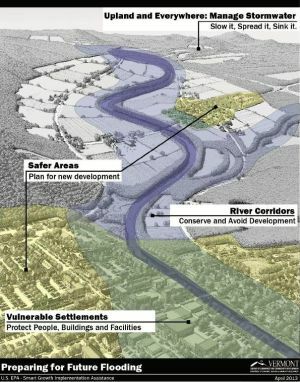 The State Rule, ANR Procedures, and the Model Flood Hazard Bylaws allow for infill and redevelopment within state or locally designated centers or in proximity to other existing improvements, as long as the new development is no closer to the river than existing development and does not require new channel management to protect the new investment that would not otherwise occur. No. State and federal laws do not require you to purchase flood insurance because your house is located in a river corridor. The federal requirement for flood insurance applies when your property is located in a FEMA Special Flood Hazard Area and you have a federally backed loan or mortgage on the property. However, if you do find yourself in a mapped flood hazard area or river corridor, and you do not have flood insurance, you should strongly consider purchasing a NFIP flood insurance policy. If your house is not in a FEMA Special Flood Hazard Area but is within the state-delineated river corridor, you can buy a policy for a much lower cost (i.e., rated as though your house were in a low risk location outside the flood hazard area). During the initial development of the river corridor base map, the DEC recognized the Connecticut River flows in a unique geologic and geographic setting and is influenced by numerous impoundments. In order to create an appropriate River Corridor for the Vermont side of the Connecticut, the Rivers Program will conduct a separate analysis in 2019 to review the influence of features such as escarpments and impoundments that affect fluvial processes, valley bottom lands, floodplains, river planform, and corridor widths. For Vermont projects being reviewed while this River Corridor is being developed DEC will make site specific river corridor and floodway determinations in accordance with the Flood Hazard Area & River Corridor Protection Procedure. When the Connecticut River Corridor is developed it will be available for a public review and comment similar to the release of the Statewide River Corridor Base Map. The state Flood Ready webpage is packed with information to help a community access maps and other tools to begin the important work of protecting river corridors. In summary, the naturally stable, least erosive form of a stream or river is a tremendous community asset. If river corridors are not protected at the community level, we as a State will bear an ever-increasing burden (i.e., in terms of flood disasters and the human misery they cause) when there are less and less places on the landscape where streams can expend the flows and erosive energy of a flood. When we encroach on a river in one location and then armor the river to protect our investment, we very often ensure that the next flood of equal flow will cause even more destructive erosion downstream. Breaking the vicious cycle between increasing costs and increasing risk, can be achieved and is sustainable where we allow floodplains to flood and rivers to meander in those corridors that still remain open. These riparian features are a part of our green infrastructure, that when squandered results in millions spent during disaster recovery to fortify channelization practices and rebuild—with little or no reduction in the vulnerability of our communities.